The Socialist party (PSOE) in the Madrid regional assembly says it is filing a motion of censure (“no confidence”) against regional President Cristina Cifuentes of the Partido Popular (PP) over the scandal involving allegedly falsified documents and other irregularities in a Master’s degree awarded to Cifuentes by Madrid’s Universidad Rey Juan Carlos in 2012. The scandal broke when reports in the daily El Día newspaper showed that Cifuentes obtained the Master’s degree in jurisprudence under irregular circumstances, having begun the course three months after other students and having never attended a classroom lecture or taken a single written exam. In recent days, reports by the daily El Confidencial also appeared to show two of three signatures of professors on her Master’s certificate had been falsified and that Cifuentes’ claim before a special plenary session of the Madrid assembly on Wednesday that she did manage to sit for a final oral examination by a panel of professors was not true. 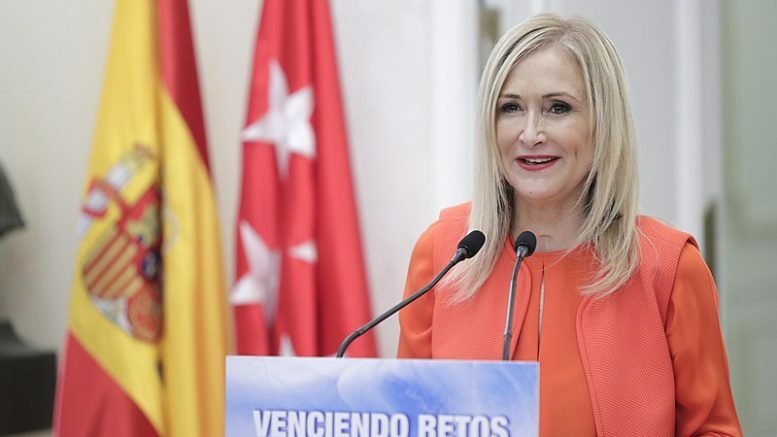 Immediately after the plenary session Wednesday, the PSOE announced it would try to topple Cifuentes with presentation of a motion of no confidence, offering the Socialists’ spokesman in the regional assembly, Ángel Gabilondo, as a candidate to replace her. The PSOE’s leftwing rival Podemos has said it will support the move against Cifuentes, but so far the motion lacks sufficient votes in the assembly to proceed, with centre-right Ciudadanos party saying a no-confidence motion is not yet warranted and that it favors simply setting up a parliamentary commission to further investigate the matter. In fact, according to PSOE sources cited widely in Spanish news reports, the Socialists are well aware that their attempt to unseat Cifuentes is not likely to succeed. But in addition to undermining Cifuentes’ grip on power in the Madrid region, the Socialists hope the censure motion will put pressure on Ciudadanos over the apparent contradictions between the oft-repeated public statements by party leader Albert Rivera in favor of transparency and against corruption and Ciudadanos’ continued support of Spanish President Mariano Rajoy’s corruption-plagued PP party at both the national and regional levels in Spain. Rajoy was re-elected to a second term in office in November 2016 with crucial support of 32 votes from Ciudadanos deputies in Congress, after both parties reached a much-touted “anti-corruption pact” that tied Ciudadanos support to a commitment from the PP to fight corruption within the party’s ranks.